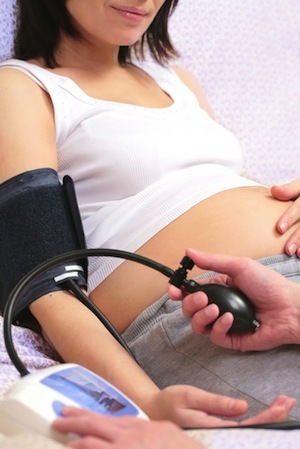 Pregnancy hypertension is recognized as one of the most common pregnancy complications. It occurs in as many as 10% of all pregnancies. Gestational hypertension, chronic hypertension, and preeclampsia/eclampsia are among the most common causes of complications occurring during pregnancy. Chronic hypertension is also often called "essential" hypertension because the exact cause is usually unknown. thought some think is is linked to the implantation phase of the pregnancy. When the fetus implants in the uterus, the blood vessels are normally calm and functioning properly. In women who experience, pregnancy induced hypertension or preeclampsia, these same vessels constrict causing the blood pressure to rise. How Is Pregnancy Induced Hypertension Diagnosed? At every prenatal checkup, the vital signs of mom are taken. If the blood pressure readings consistently rise or measure about 140/90 mmHG, hypertension is diagnosed. Hypertension diagnosed before pregnancy and before 20 weeks is usually called chronic hypertension, while hypertension first found after 20 weeks is reffered to gestational hypertension or preeclampsia if certain addition findings are present. Who Can Exhibit Pregnancy Induced Hypertension? Women who get pregnancy before the age of 20 or after the age of 35 are more commonly diagnosed with pregnancy induced hypertension. A history of diabetes, hypertension, twin or triplet birth and being of African descent can all cause an increase in the chances of exhibiting hypertension during pregnancy. What are the Types of Pregnancy Induced Hypertension? Gestational hypertension is the most common form of pregnancy induced hypertension. The pregnant mom will most often be diagnosed with gestational hypertension in the last trimester of the pregnancy and exhibit only an elevated blood pressure reading as a symptom. Preeclampsia offers the same symptoms and diagnosis time frame as gestational hypertension. Protein will also be found in the urine during the normal prenatal urine screen. Eclampsia is preeclampsia with seizures and is the most serious of all forms of pregnancy induced hypertension. The mother-to-be can suffer from seizures and other complications. The symptoms of pregnancy induced hypertension will include an elevated blood pressure reading, often also swelling of the face and neck, weight gain beyond normal pregnancy weight gain, vision impairment, headaches, stomach pain, nausea and vomiting. Complications can include, leaking blood vessels in various parts of the body. When the blood vessels leak swelling, shortness of breath, swelling of the liver, and liver damage can occur. Leaking protein into the kidneys can affect the birth weight of baby. After the baby is born, the signs and symptoms of pregnancy induced hypertension will most often disappear. The effects of the high blood pressure, however, can last far beyond the pregnancy. The organs damaged by the high blood pressure during the pregnancy may not be able to heal and the mother may be left with illnesses after birth related to that damage. Vision problems, liver illness, brain damage and HELLP syndrome can all be diagnosed after birth related to hypertension during the pregnancy.